.The interest in a new release, and a live one at that, from legendary vocalist John Waite would, you'd imagine, garner a fair bit of attention, surely enough to warrant a record label chancer to put his money where his mouth is and maybe make a little more. The legend returns with a new live album  a follow up to 2010's live release In Real Time. But this time around we have a different band in tow. Bassist Tim Hogan remains, joining in now is guitarist Keri Kelli and drummer Rhondo. A tight little outfit is on show here. but they are 8 great songs. And what's better  this is about as raw and live as it comes. A straight feed from the show itself, with no overdubs. but without some of the naturally occurring sonic flaws live albums can have. And John's lead vocals are really superb here  powerful and crystal clear. John Waite such an engaging artist. most consistent and brilliant debut solo albums (Ignition). quite simply one of the best John Waite songs ever written. And is sounds great in this raw, electric, engaging format. Love and Theft),shows John's powerful and unique vocals off nicely. hard edged approach that I loved with John's first few solo records. vocals piercing the atmosphere of the recording. here with Keri killing it on guitar  complete with a nice long solo intro. Evil is another masterpiece track from the Rough & Tumble album. Honest to God, it is a serious injustice that this song wasn't a hit single. and its killer hook is undeniable. This rawer, heavier live version is a treat. the double timed rocker Saturday Night  the lead track from the classic No Brakes album. This is a great version too, extended and energetic  wonderful to hear it included in the live set. So that's a wrap, so to the negatives  well, there is only 1 really. It's such an enjoyable set of songs; to have only 8 to feast upon seems cruel! This is primarily a digital release, so the physical copy is a no-frills CD Single style slip cover only. perhaps there will be a deluxe CD featuring tracks from both, fully packaged. 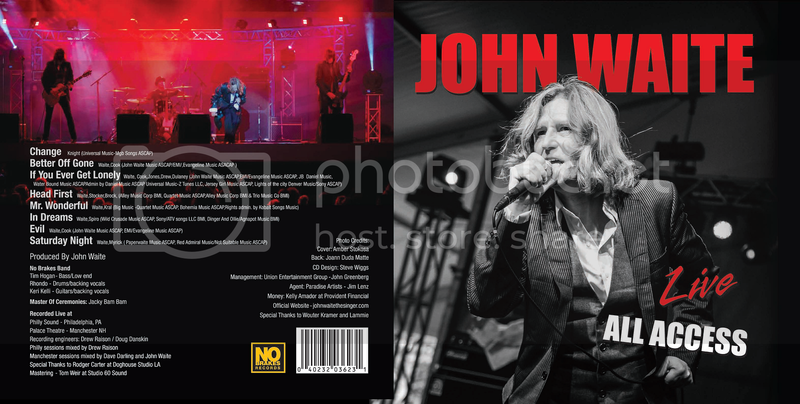 But for now  all John Waite fans need this now. featuring some great songs from the Waite catalogue.